The tee shirt that my breakfast companion wore said, “Still Plays with Trains.” It reminded me of my father, gone now a year and a half, who was a lifelong lover of trains. Shortly before his death he turned in to his editor his last book, this one about the Rochester Division of the Erie Railroad. It was from him that I learned to enjoy rail transport. Growing up, I shared my basement bedroom with Dad’s HO-gauge model railroad setup. Dad shot hours of 16mm film of trains, especially those pulled by steam locomotives. Turns out his early diesel movies were sufficiently popular they were made into videos. I may be the only Boy Scout to have earned most of his hiking merit badge by walking abandoned track in and around Rochester. Dad knew the mileages from any point to another and would drop me off at various points along the lines and I’d walk home. In 1967 on a return trip with my father from Boston to Rochester on the Sunday after Thanksgiving, we had to sit on our suitcases in the aisle from Albany to Syracuse where seats finally became available. When it came to railroads, my father could make friends with anyone. He managed to become acquainted with a Canadian National freight crew because they were still running one of the early diesels on a “milk train” route. He arranged for them to take me along for a day. He dropped me off in Madoc, ON (if I recall correctly) and picked me up in Bancroft, ON that night. I rode in the caboose (they still had them) where I helped check manifests and ate lunch with the crew. They didn’t let me anywhere near the couplings, but I did throw some switches and I rode much of the trip away from towns up in the engine. Everything the crew and I did that day broke the rules, but the crew and my father thought it would be a great experience and to heck with management’s rules. Whenever I can conjure a reasonable excuse I take train rather than fly. 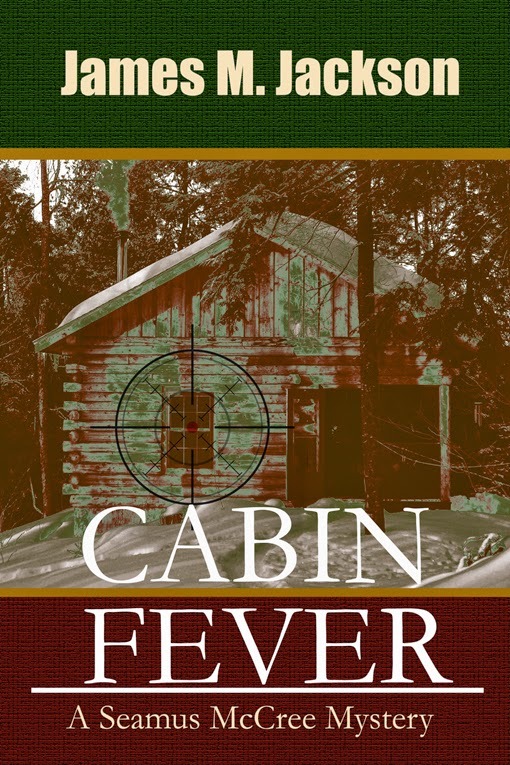 The most recent opportunity came when I decided to participate in Left Coast Crime in Monterey, CA as part of the promotion for the April 2014 release of the second Seamus McCree mystery, Cabin Fever, We took sleepers from Savannah to Washington, DC to Chicago to Emeryville, CA (outside San Francisco). After attending the conference we trained from LA to New Orleans and detrained at Birmingham where we rented a car and drove home rather than spend two more days going up to Washington, DC and back down to Savannah. On this trip the most interesting railroad-related conversation was with a guy from the Cincinnati area. He’s the engineer (civil, not train) responsible for a G-gauge (~1/24th actual size), 25,000 sq. foot train set with over two miles of tracks. It has three sections relating respectively to the late 19th century, mid-20th century and modern railroads. There are streetcars as well, realistic buildings constructed by volunteers and an elevation change of eleven feet. I’d never heard of this place and I lived in Cincinnati until four years ago. http://www.entertrainmentjunction.com/cincinnati_entertainment_and_attractions/model_trains_journey It’s on my list of things to do the next time I’m in the area. The finger bowls are gone, as are the silver and fresh flowers on the tables. 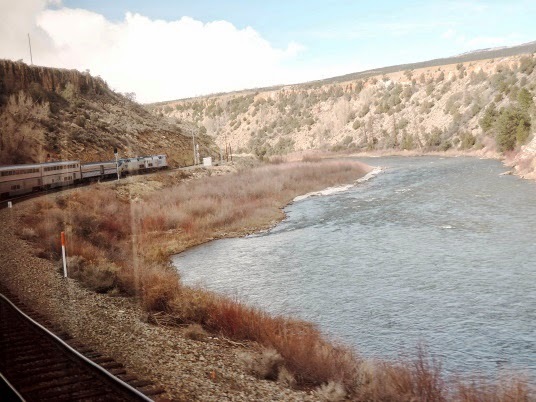 The scenery is just as spectacular, the people we eat meals with are just as interesting; and there is something that reaches deep into my core as I hear the whistle blow, we approach a crossing and a father holds his child on his shoulders to watch the train pass. The kid waves and I wave back. 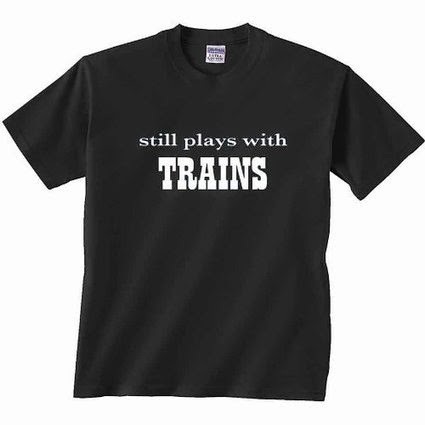 I’m thinking of asking for that tee shirt for my birthday, because really, I am just a kid who still plays with trains.